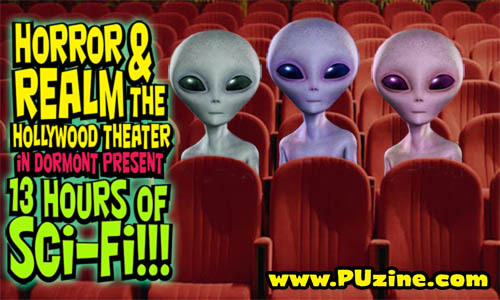 Pittsburgh Underground: Movies That Have Everything: 13 Hours of Sci-Fi at The Hollywood Theater THIS SATURDAY!!! Movies That Have Everything: 13 Hours of Sci-Fi at The Hollywood Theater THIS SATURDAY!!! 13 Hours of Sci-Fi! 10 out-of-this-world epics for the down-to-earth price of only $13! ($5 for single movie viewing). You'll see rocket ships, ray guns, alien invaders, mad scientists, rugged heroes, fabulous babes, misused radiation, experiments gone awry, nuclear mishaps, gruesome deaths, brain eating parasites, undersea adventures, freeze-dried Nazis, atomic supermen, giant reptiles, nature run amok, BEES! BEES! BEES!, guys in rubber suits, badly dubbed Asian actors, down-on-their-luck Hollywood stars, post-apocalyptic wastelands…all this, plus JOHN AGAR! Please note: an effort was made to keep this event as kid friendly as possible. Therefore, almost all the movies being shown are G to PG in nature. However, for those of you who just can't live without gore and boobies, we added a couple of R-rated features after the 10:00 PM break. Something for everyone! Cheap admission, fun flicks, comfortable seating, reasonably-priced concessions, free parking*, lots of great nearby shops and restaurants…what better way to spend a hot day in August than in the air-conditioned comfort of a friendly neighborhood movie theater! Also, this is an entirely not-for-profit event. 100% of all proceeds go directly to the Hollywood Theater. Thank you for your support!